The Perhentians is a cluster of small islands about 20km of the Northeast coast of Malaysia. There are 2 main islands: Perhentian Besar (Besar means big) and and Perhentian Kecil (Kecil means small). There are also a couple of smaller, uninhabited islands, many can be visited on snorkeling tours offered on Besar and Kecil. Fun fact: in Malay ‘Perhentian’ means ‘Stopping point’. The island was an important waypoint on the trading route between Bangkok and Malaysia. The ocean around the islands is a designated marine park and is famous for its underwater world. Which is exactly why we traveled to the Perhentian Islands! 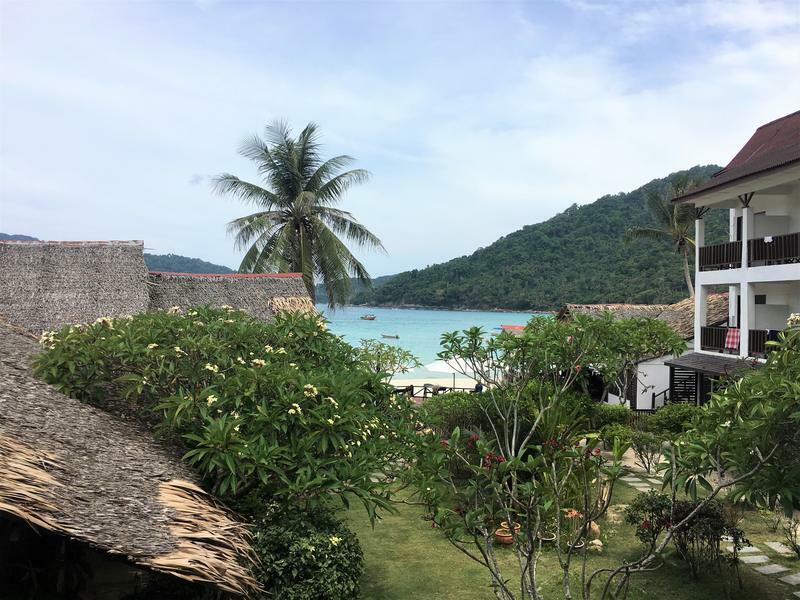 We stayed at Perhentian Kecil, Long Beach to be exact. More about where to stay further on in this post. However, the most important reason for us to book a ticket from Kathmandu to Malaysia was to go diving. 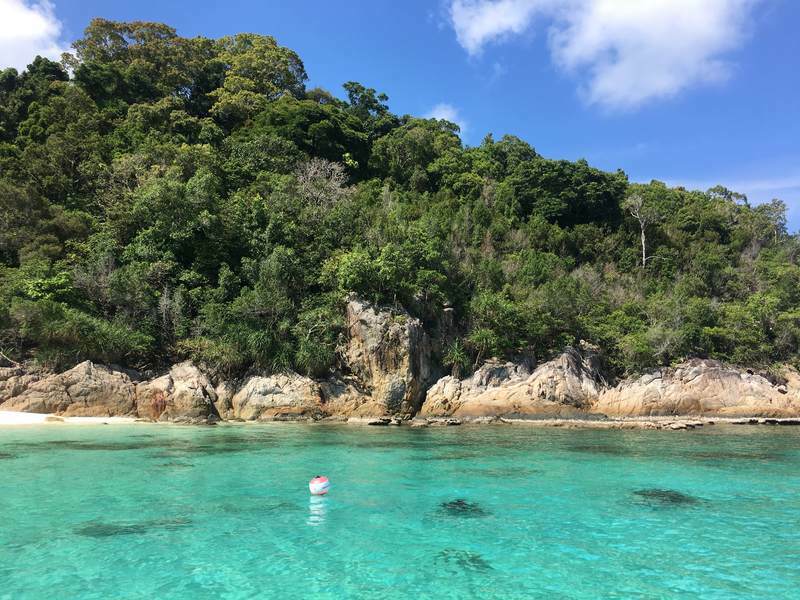 The Perhentian Islands are great for scuba diving (and snorkeling as well). 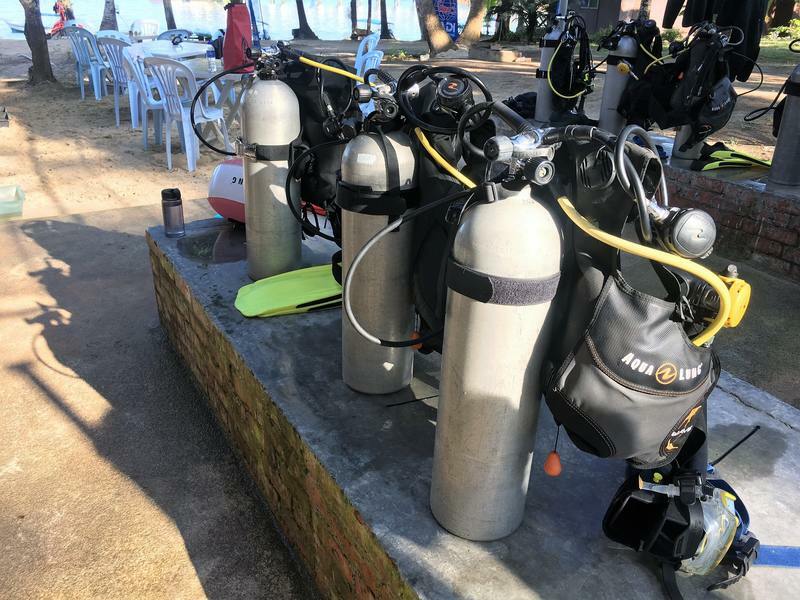 Diving is addictive and since getting our PADI 2 years ago, it’s gotten to the point that researching the dive opportunities is one of the first things I google when deciding upon visiting a country. So when Frank and I were brainstorming where to go after Nepal these little islands popped up and before we knew it we were on a boat to paradise. Well, ‘before we knew it’ isn’t entirely accurate. Getting to the Perhentians actually involved several transportation steps, you can read more about that below. 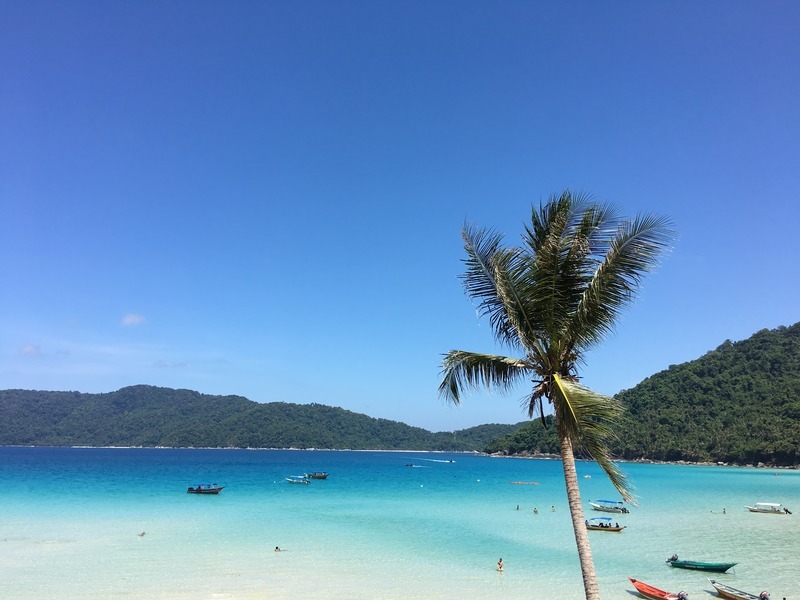 How to prepare for your trip to the Perhentian Islands? First of all, be sure to get enough cash on the mainland. There are no ATM’s on the islands, however, you can pay with credit card at larger resorts as well as at some dive shops (though they will charge extra for this). 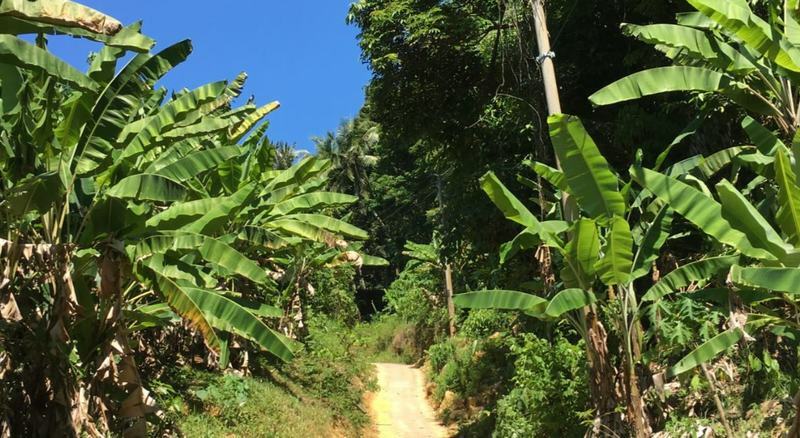 Second of all, there are no supermarkets on Long Beach or Coral Bay so be sure to buy all your essentials (mosquito repellent, sunglasses, sunscreen, flip-flops, etc) on the mainland. Finally, keep in mind that peak season is in July and it can get very busy during that month. If you plan to travel during this time, booking a room ahead is a smart thing to do! We took a bus from Kuala Lumpur, unfortunately the night bus was already sold out so we traveled with the 9.45am bus. We booked a ticket online, the bus was operated by Perdana Express. It was a modern and luxury bus with reclining seats and nowhere near full (probably because everybody was traveling on the night bus…). The bus left on time, stopped for lunch around 1pm and arrived in Kuala Besut around 6pm. We spent a night in Kuala Besut because the last jetty leaves around 5pm. 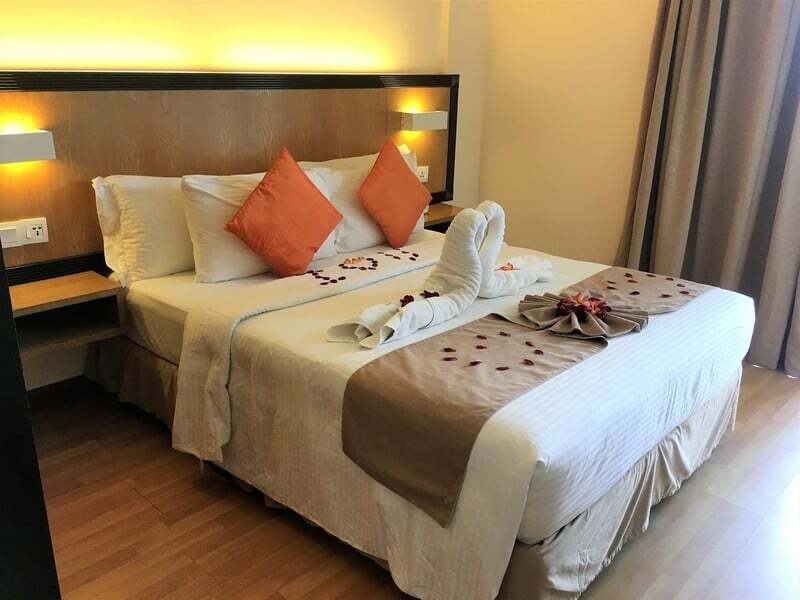 We stayed at Kuala Besut Transfer Hotel above the bus station. 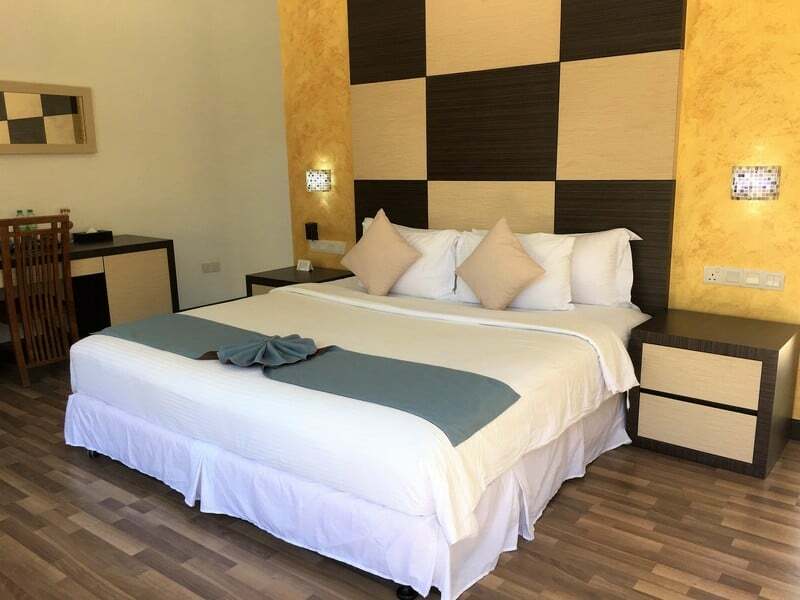 The room was 100RM per night, had air conditioning and was clean. In the street across the jetty terminal there are two nice places to eat: La Wood Cafe (for lunch) and April Cafe (for dinner). Price: a bus ticket from Kuala Lumpur to Kuala Besut costs 44RM. If you book online you pay a 2,90RM transaction fee. Where to catch the bus: the bus leaves from Kuala Lumpur TBS (Terminal Bersepadu Selatan) which can easily be reached from KL city center. We took the LRT (Sri Petaling Line) at Plaza Rakyat, a 5-minute walk from our hotel. We stayed at BuBu resort, they have their own speed boat service so we didn’t travel to the islands by jetty. However, buying a ticket for the jetty is easy. Just walk from Kuala Besut bus station to the jetty pier (about 1km) and look for the ticket office. A ticket costs 35RM one way, but it’s convenient to buy a return ticket. You can also book your ticket online online, the site provides information about departure times as well. Everybody going to the islands must pay a Marine Conservation Fee, for foreigners this fee is 30RM per adult. 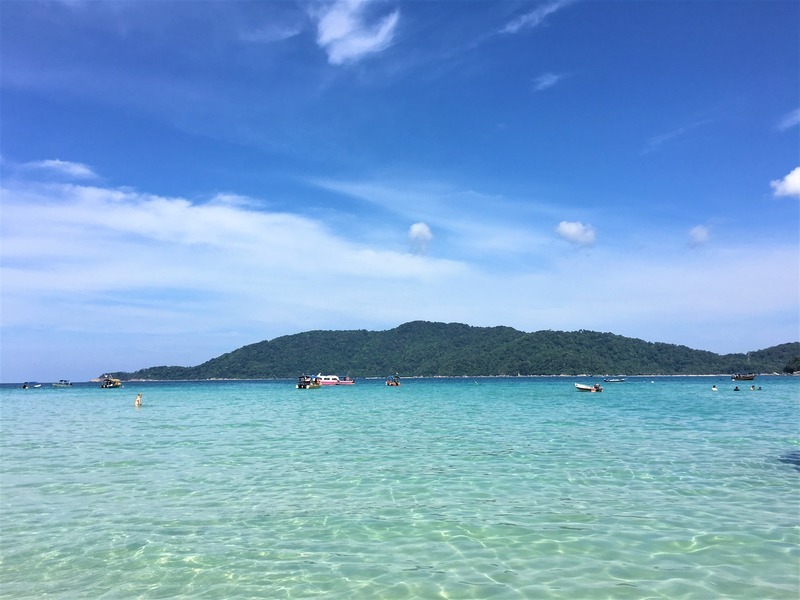 Unfortunately, the Perhentian Islands are not a year-round destination. Between November and March it’s monsoon seasons and the islands are closed (for tourists). 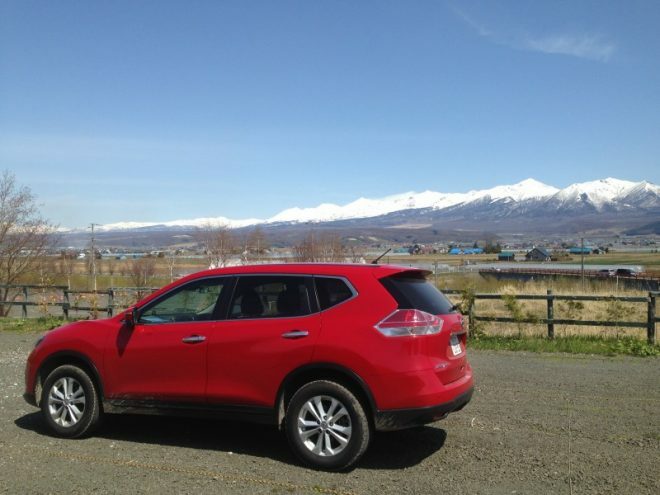 We visited in at the end of April and had beautiful weather. Yes, it was hot and humid, but sunny every day:-). After arriving at the Perhentian Islands, diving was the first thing we arranged. We went diving with Anti Gravity Divers, located in Coral Bay on the West coast of Perhentian Kecil. The dive shop is at near the end of the beach on the left-hand side. Other important things to me are the size of the groups and the dive master. All the staff at Anti Gravity Divers spoke perfect English and happily answered all our dive questions. We did all our dives with dive master Matt. 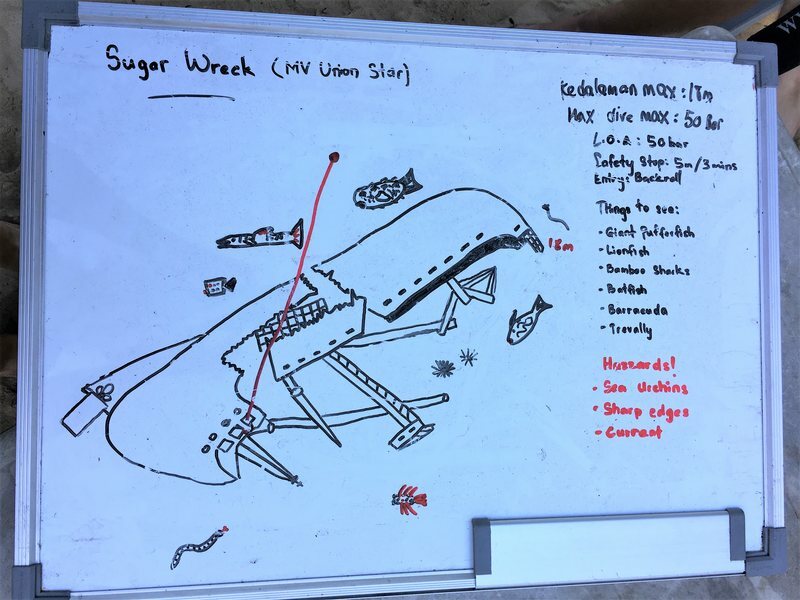 He did an excellent job at the dive briefings, going over the safety procedures, showing us a drawing of the dive site and explaining about fish we could expect to see and potential hazards. I like diving in small groups and our dive group was between 3 and 5 people, which was perfect. Smaller groups mean the dive master can easily keep an eye on everyone. It also makes it easier to stick together as a group and spot cool fish (if you are in a group of 10 people chances of the shark still being there when you arrive as #10 are pretty slim?). 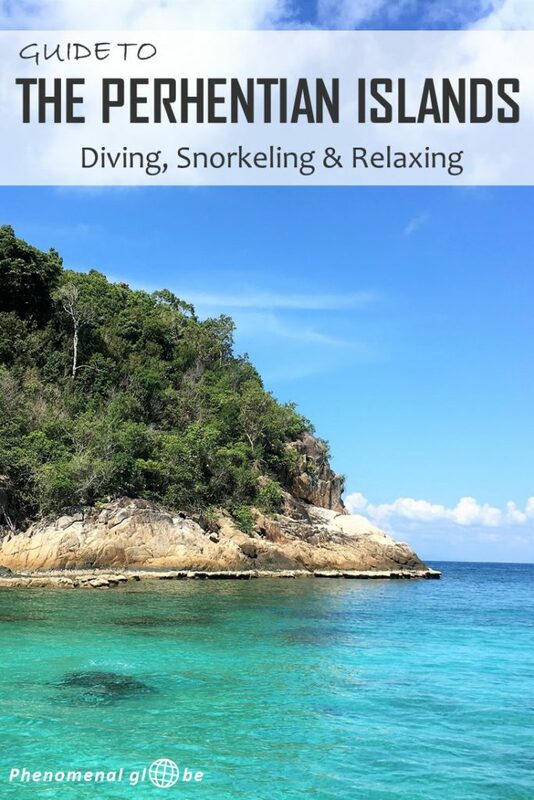 We did 4 dives around the Perhentian Islands and went to 3 different dive sites. We went to Lokong Laut, the top dive site of the area twice, lucky us! Tokong Laut is a pinnacle and is also called ‘Temple of the Sea’. The deepest point of the dive site is 25 meters, we started our dive at the bottom and slowly made our way up around the pinnacle. There were so many fish and amazing corals! We were lucky to do 2 dives here, both were quite long (56 and 51 minutes) so we had a lot of time to explore this amazing site! Visibility was great, between 10 meters at the bottom and 15 meters at 10 meters deep. Our second dive was at Romantic Bay, a relatively shallow site (13 meters at the deepest) with lots of big boulders to swim around. 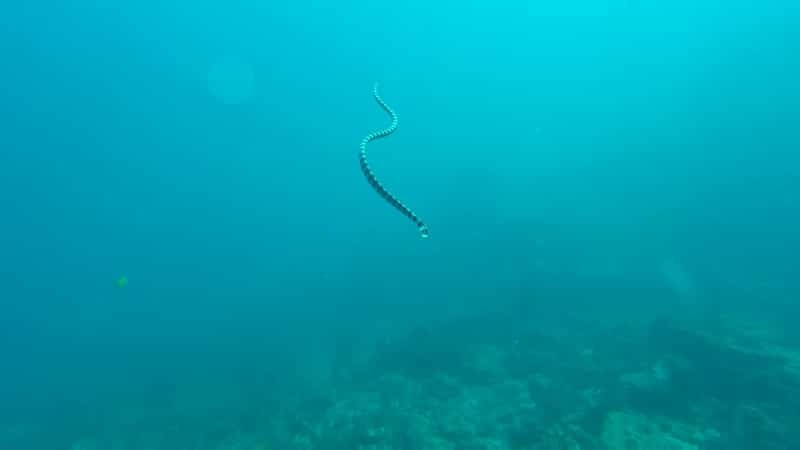 We saw moray eels, clown fish, butterfly fish, longfin bannerfish, a tiny coral crab, see-through cleaner shrimps, tiger crowrie, angel fish and more. 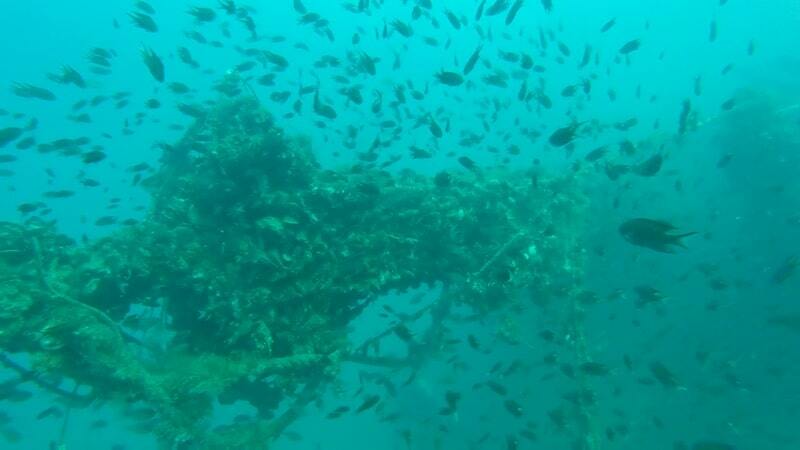 This was our second wreck dive, our first wreck dive was in Koh Tao, Thailand. Sugar Wreck lies 18 meters underwater and it’s an awesome dive site! The ship sank during the monsoon season in 2000 while transporting sugar (hence the name). What’s cool about the wreck is that it’s on its side. The ship is 80 meters long and you can swim completely around it. My favorite part was checking out the mast, nets and the top of the ship. 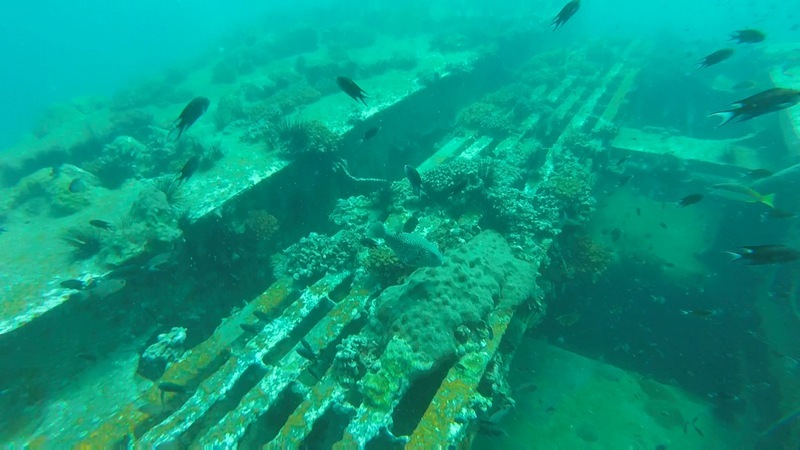 It’s amazing to see how the ocean is slowly taking over the boat, there is so much cool stuff growing on the wreck. During the dive we saw pick handle barracuda, moray eels, a bamboo shark, a mappa pufferfish and many schools of different kinds of fish swimming around the wreck. Visibility at the bottom was not that good (around 3 meters) but the higher we got, the better the visibility (at the top of the wreck it was at least 10 meters). Depending on the number of dives you do, prices at Anti Gravity Divers vary between 70-90RM per dive. For the Sugar Wreck there is an additional charge of 20RM. 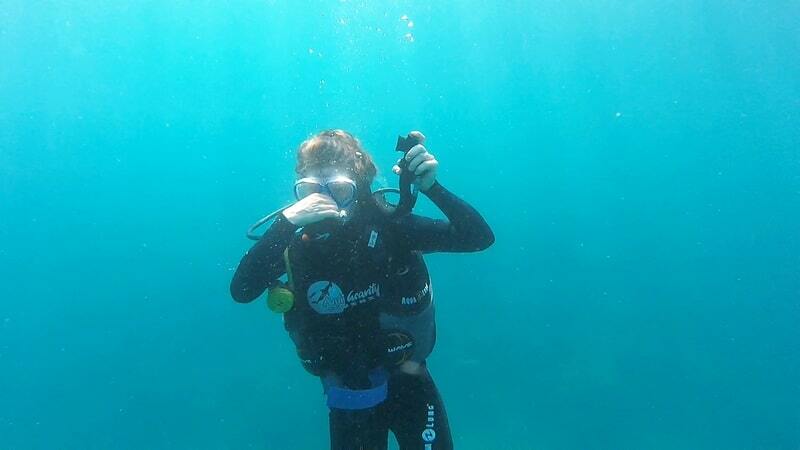 A PADI Open Water Course costs 1150RM, so approximately €240. If you do a course at Anti Gravity Divers you can stay in their dormitory for free. 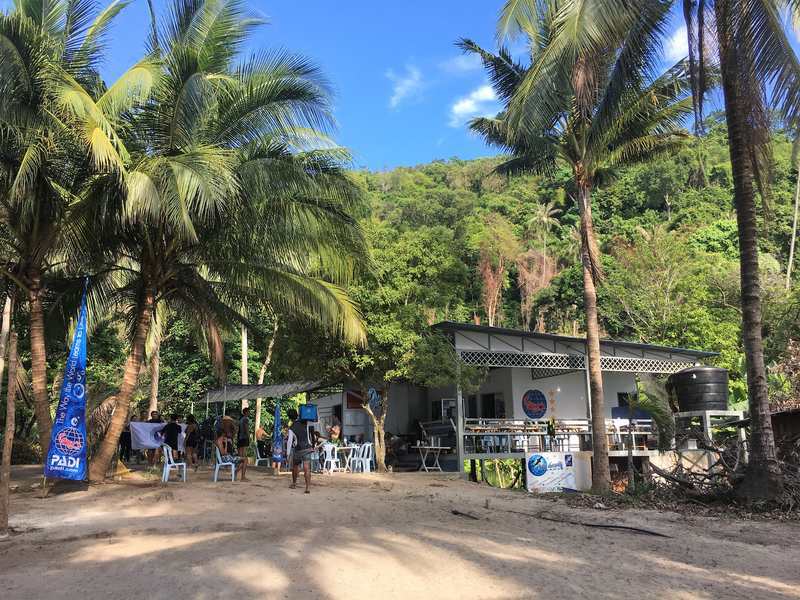 There are also a couple of bungalows next door belonging to Maya Chalet (which the dive center can help you book), the beach-facing ones are 90RM per night and the ones in the back are 70RM per night. You can find more info about the prices for diving here. 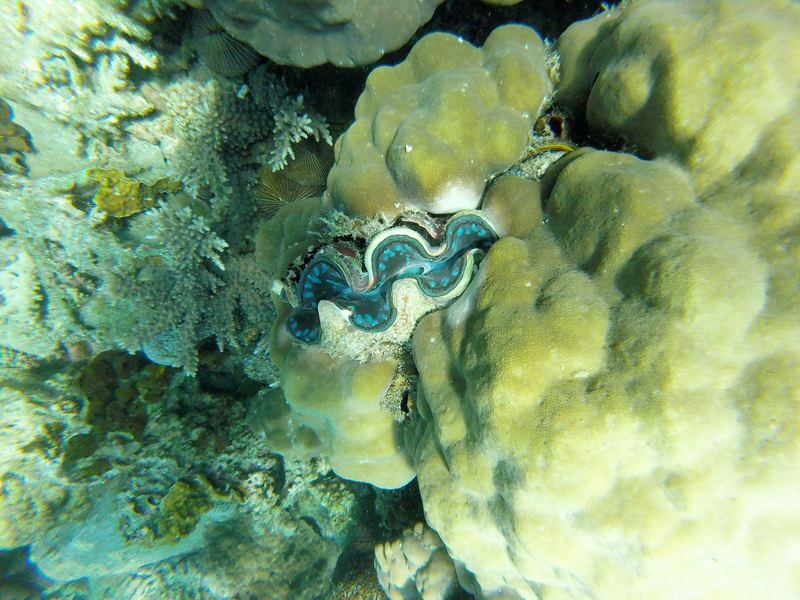 For us diving was our primary reason to go to the Perhentian Islands. Well, diving and relaxing at our resort (more about that below). But there are other things to do on these beautiful little island as well. 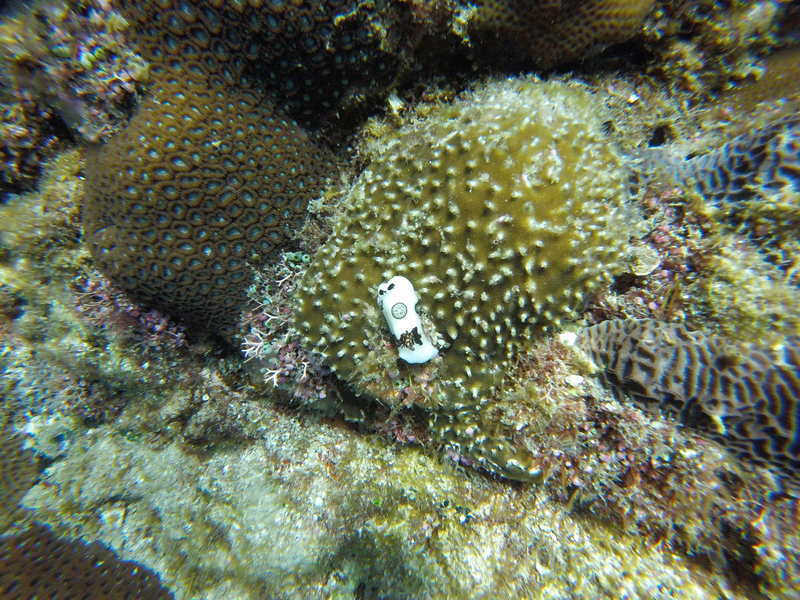 If you are not into diving but do like to explore the underwater world, you can go snorkeling. Snorkeling on Pulau Perhentian Kecil is (almost) just as beautiful (and a lot cheaper than diving). There are tours offered everywhere on the island, but if you are staying at Long Beach you can also just get your mask and snorkel and swim to the rocks behind the jetty pier. 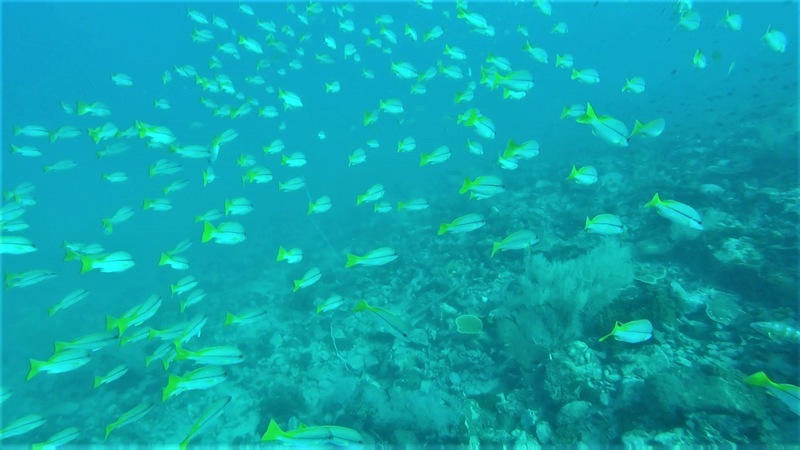 There are beautiful fish and even coral very close to the shore! 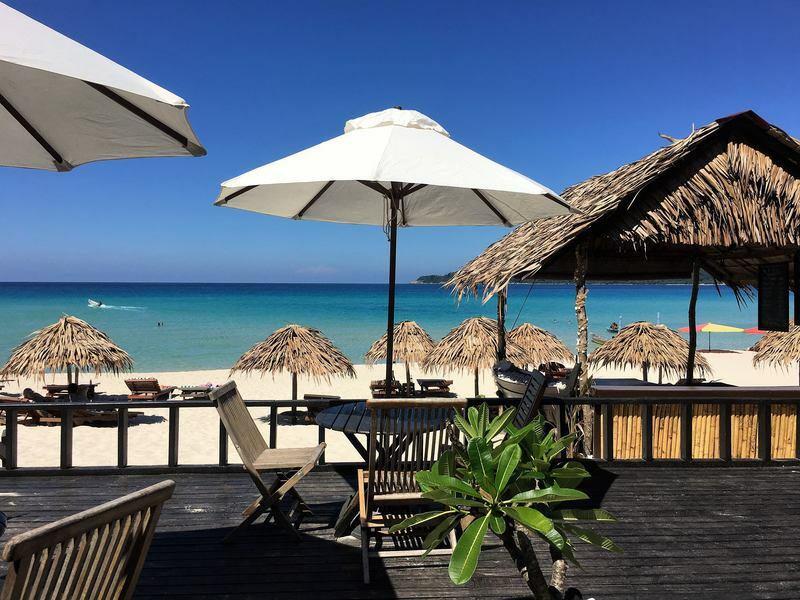 We were lucky enough to stay at BuBu Resort, a beautiful hotel located at Long Beach on Perhentian Kecil. Each morning the smell of freshly baked croissants lured us to the breakfast buffet. Breakfast options included made-to-order vegetable omelets, yogurt with cereals, salad and fresh fruits. A cup of Italian coffee completed our daily breakfast ritual. The food menu for lunch and dinner was excellent. 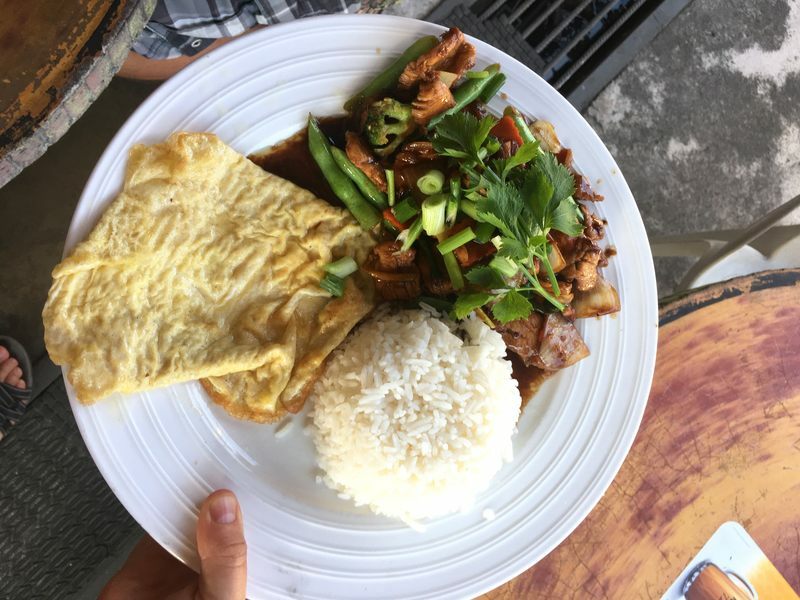 Food prices are higher than at other restaurants on the island, but the quality is also much better and the portions are generous. 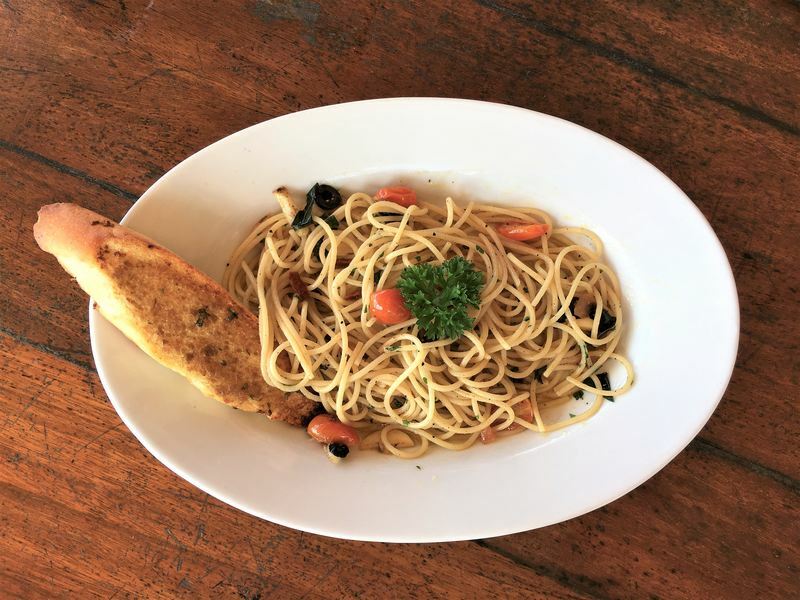 There is so much to choose from, we tried everything from the Club Sandwich to the Thai Green curry and from the Beef Skewer to the Aglio e Olio pasta. It was all delicious! The BuBu staff is great, all of them were very welcoming and they knew our name after one afternoon. There is no pool, but who wants to swim in a pool anyway when you have the most beautiful ocean in front of the resort. – The boat to the resort leaves at 11.30am and 2pm. – The boat to the shore leaves at 10.30am and 12.30pm. BuBu also operates a sister hotel, BuBu Villa, at the opposite side of Long Beach. We checked out a couple of the beautiful villas and they look perfect for a romantic getaway or a family vacation. 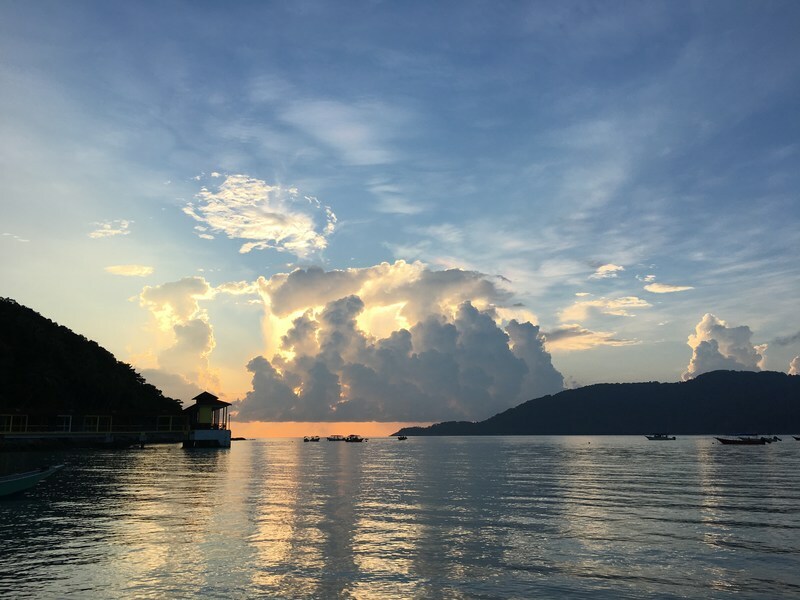 We had a wonderful time at the Perhentian Islands, for us it was just what we needed after Nepal: diving at beautiful sites and relaxing with a perfect view. You can read more about our travels in Malaysia here. Tioman or the Perhantian Islands? First of all, both islands are beautiful so there is no wrong decision here. The villages at Tioman where I stayed (Salang and ABC village) were very small, a handful of accommodations, no paved road and just one dive school. 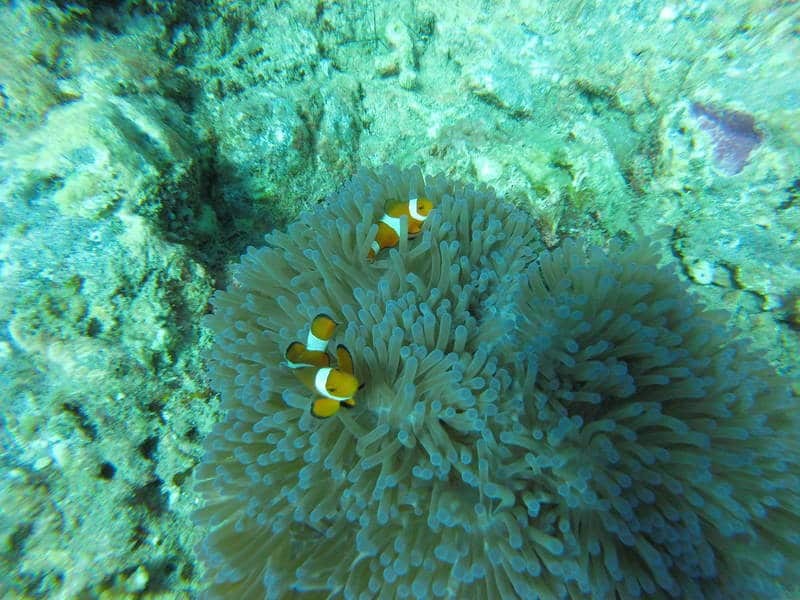 We were on Tioman during the week and there were few tourists. However, during weekends Tioman gets very busy with visitors from Singapore and KL. If you prefer peace and quiet I strongly recommend to avoid the weekend. 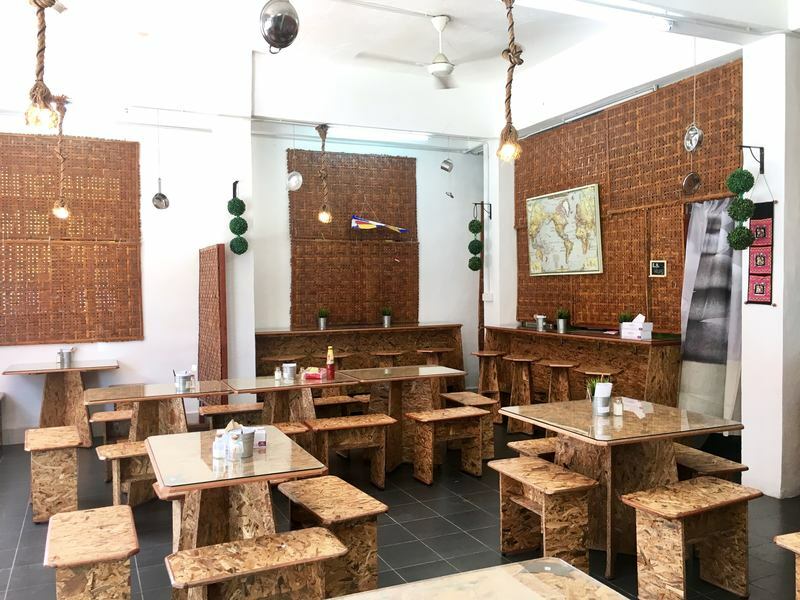 All accommodation at Tioman is very basic (at least it was when I visited in 2015), think bamboo cottages on the beach with no hot water and a fan. 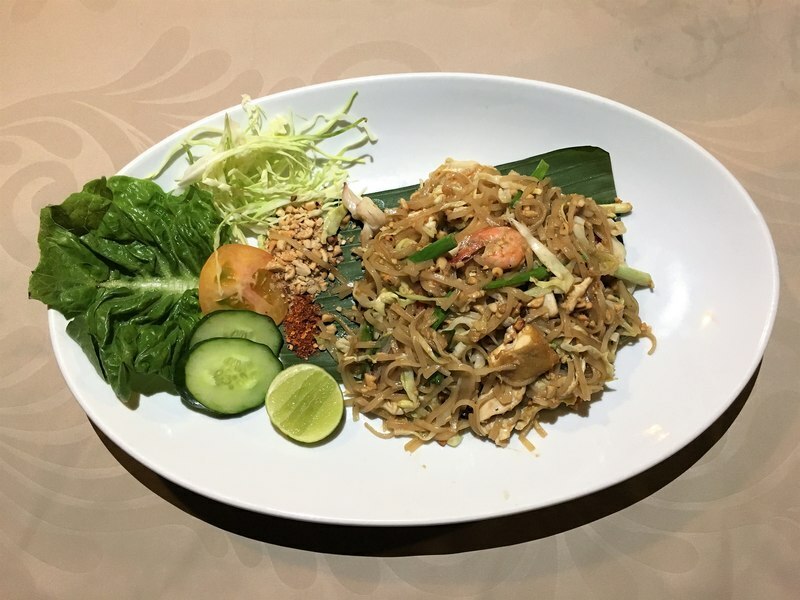 There are no large resorts in Salang and ABC and only a couple of restaurants. 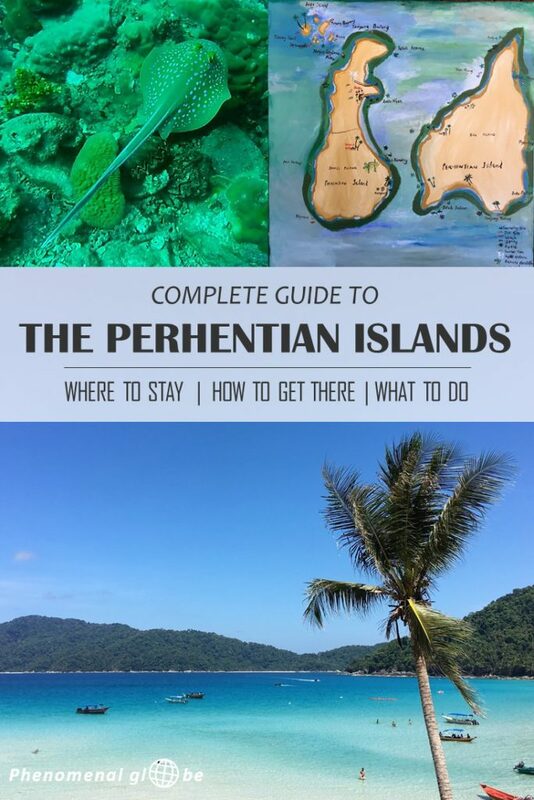 For both Tioman as well as the Perhentian Islands it takes some effort to get there. 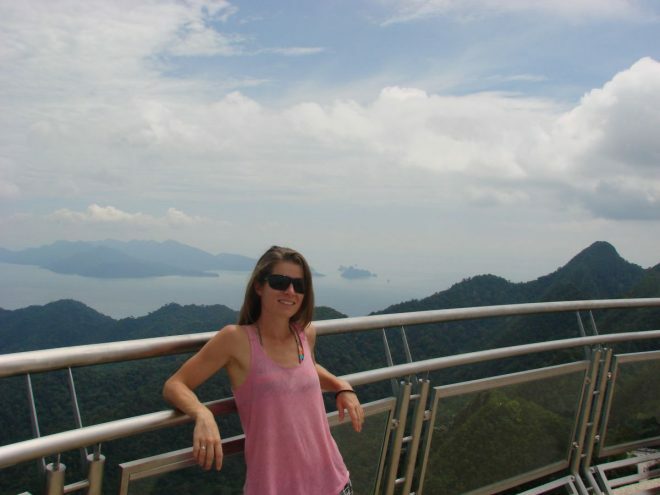 You can find more details in my Malaysia itinerary. Perhentian Kecil is slightly more busy than Tioman, though I definitely wouldn’t call it crowded (at least, not when you visit outside of peak season, which falls in July). We stayed at Long Beach but our dive school was on the other side of the island, in Coral Bay. Accommodation on the Perhantians is more varied, you can find budget accommodation but also a luxury resort (Bubu, where we stayed). So again, you can’t really make a wrong decision! Looking for more beautiful islands to visit in Southeast Asia? 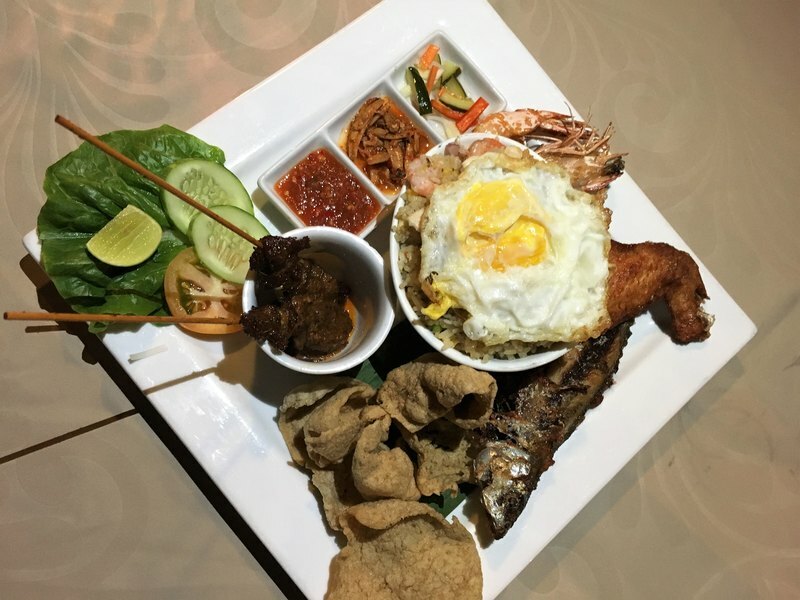 Also read my guide to Langkawi, Bali itinerary, El Nido travel guide and Phu Quoc scooter itinerary. Disclaimer: I was a guest of Anti Gravity Divers and BuBu Resort. Nevertheless, all pictures and opinions are my own. 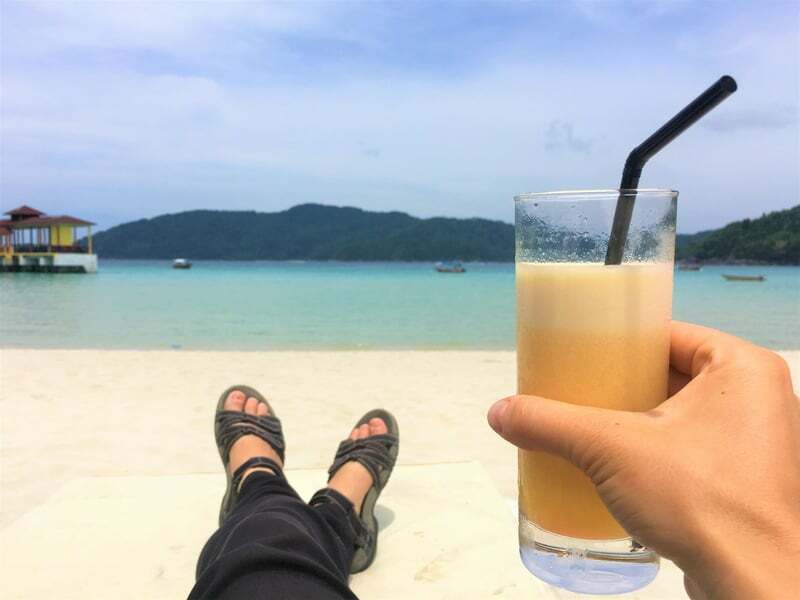 Hey Lotte – looks like you had a fantastic time on the Perhentians. Looking at the photos makes me want to pack my scuba gear and go over there! Thanks for sharing. My partner and I are considering Malaysia and scuba diving for the summer holiday. Which did you prefer, Tioman or Perhentian? Both look great under water, but over-all (accommodation, price, number of people etc.) what would you say? My partner has the PADI certificate but hasn’t been diving for many years whereas I would have to take the course there. So we’re both beginners. At Tioman I stayed at Salang and ABC village, both are very small. We traveled during the week and there were few tourists. 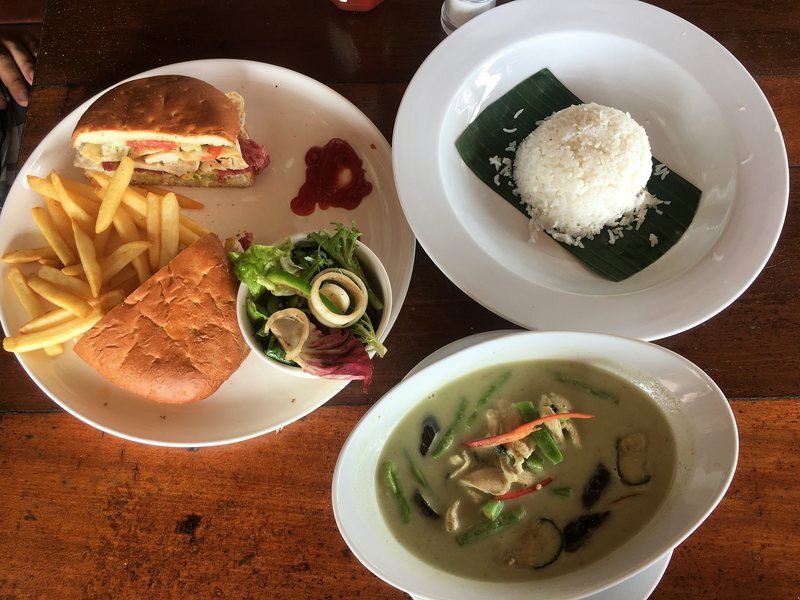 During weekends Tioman gets very busy with visitors from Singapore and KL, so if you can, avoid the weekend. All accommodation at Tioman is basic (at least it was when I visited in 2015), think bamboo cottages on the beach with no hot water and a fan. Perhentian Kecil (which funnily enough means small) is slightly more busy than Tioman, though I definitely wouldn’t call it crowded. 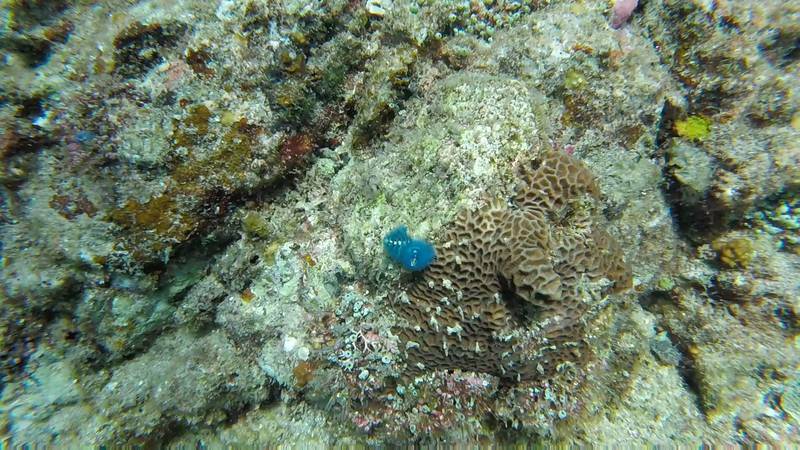 We stayed at Long Beach, our dive school was in Coral Bay. Accommodation on the Perhantians is more varied, you have budget accommodation but also a luxury resort. 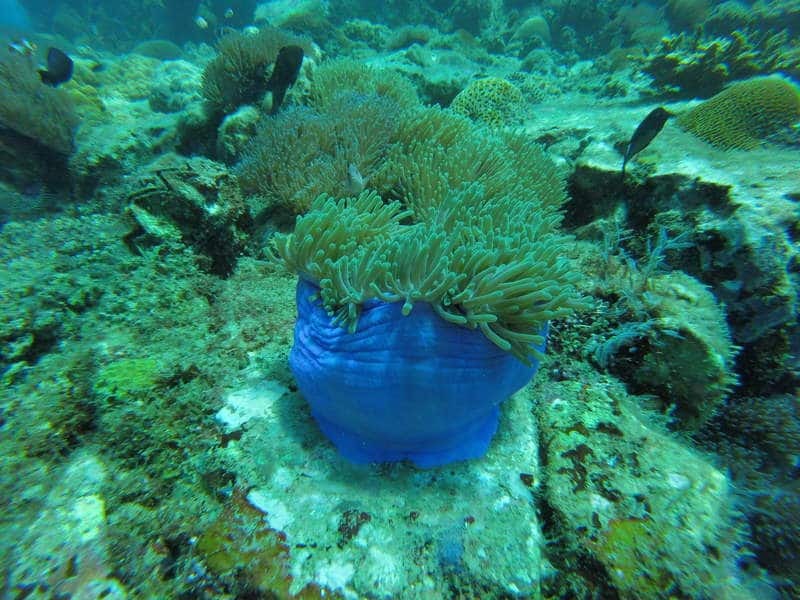 Dive prices were similar and both locations have stunning coral. At Tioman I saw turtles but at the Perhentians I did a wreck dive… So again, you can’t really make a wrong decision! Have a wonderful trip and I’m curious to hear where you end up going. Have a wonderful trip to the Perhantians!